It is becoming more and more difficult to report news from Greece, my country, in an unbiased manner. It is becoming obvious, more and more every day, that there is a “conspiracy” (for lack of a better word) to slaughter labour rights and therefore the working people for the benefit of an undefined and mostly imaginary “development”. It is a universal truth that “development” is a desirable state. Who wants to stay behind? The dilemma that emerges today in our part of the world is “Development for whom? Development in what direction?” Is it “development” to turn into desert a spot of natural beauty in order to “create jobs”? Is it “development” to ask people to work, uninsured, for whatever salary his employer suggests? Is it “development” to dismantle hospitals on far away islands without providing adequate health facilities? Is it “development” when salaries drop and prices skyrocket because they follow the rules of the market? Does the Greek situation mark the return of TINA-there is no alternative, according to Ms Thatcher, to the barbarism of unbridled profiteering? The general sentiment is that the country is cruising towards a steel door and no one can find the brakes. 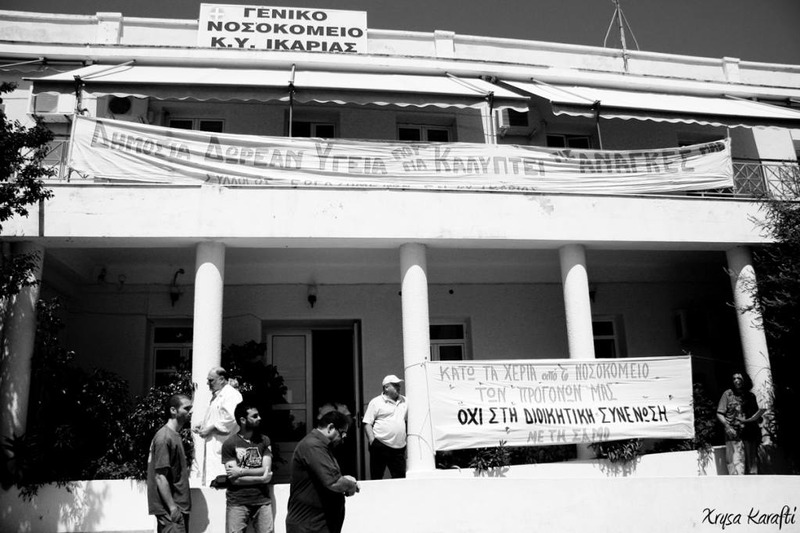 The hospital of Ikaria, built by funds donated from expatriates and not by the State, is ‘abolished” and the islanders sent to nearby Samos. It is obvious that this is a move planned on the map and not rooted in reality. During the winter months the Ikariotes are cut off from any other land and have had to look after themselves for centuries. Now they have to become their own doctors and midwives. John, 43 years old, has been a shopkeeper all his life. His record shop in one of the southern suburbs of Athens was a meeting place for music lovers. Two years ago he was forced to close it due to lack of customers. “I am luckier than most, he smiles. I have found a seasonal job and the summers are long in Greece”. What happens in the winter, I wonder. “I collect unemployment but also go to my father-in-law’s olive grove and help him out. It is not a lot of money but I get the olive oil of the year. I have no children, my wife works, I am better off than many others”. I met John at the Metropolitan Social healthcare Center in Ellinikon where he works as a volunteer three times a week. The Center started with about 60 volunteers and today has about 150. The Municipality of Elliniko – Argyroupoli covers the administrative expenses. What does John do at the healthcare center? “I collect the information and direct the patients to the relevant doctor. I make appointments, give information, help out wherever needed. As I said I am better off than most so I want to give something back”. Annoula is about 43 too. She is divorced and has a teenage son. Her ex-husband helps with the expenses. “He still has a job but is also insecure”. An award – winning graphic artist for 20 years Anna lost her job when the record company she worked for went bankrupt four years ago. With her redundancy pay she set up her own office creating newspapers lay outs, collaborating with various municipalities in their cultural events. “I was doing well for some time. When the crisis hit the municipalities- who were among my best customers – and they stopped paying me I found myself on the rocks. They cut off my electricity supply and my telephone line. My ex-husband and close friends helped out but it is an ongoing struggle. I am thankful I don’t have to pay rent. I had to stop my son from English lessons and tuition for the exams but he is fifteen, he has to eat well. I am thinking of going to live on my father’s home island where everything is cheaper and I could rent the Athens house but that would be detrimental to my son’s future. I am looking for a job, any kind of job but so far have found nothing.” She is not eligible for unemployment benefits and her state health insurance will soon be over. “ I remember at this time last year I was collecting money to help another friend pay her electricity bill. I can’t believe it is happening to me now”. George has just finished his studies and has been looking for a job for less than six months. “The starting salary is about 550 Euros if you are lucky. Employers take advantage of the situation and avoid paying the state insurance fund which means that I am not entitled to health care and of course I shall never get a pension. My friends and I are thinking of starting our own internet company selling photographs, videos, news about Greece. George’s parents are diaspora Greeks and they have no village so their only hope is immigration but they are not so keen about it. “I remember my father always talking of the home country. I want my son to live here and have a home. I shall do my best to help him. We have to be patient”, says Peter, George’s father. Four people hit by the crisis, four stories of struggle and survival. All four are active in the solidarity movement, everyone in his/her way. All four are striving to keep their integrity and humanity. This is the bet Greek society has to win. 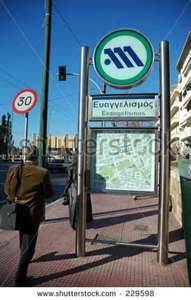 Greek metro employees are on a 24 hour strike today. The tram and the trolley busses will operate from 8 to 16 hours. Tomorrow Tuesday all the above mass transport systems will not operate from 12 to 16. The Union has called for an assembly tomorrow Tuesday at 11 o’clock to coordinate future actions. According to the Union’s statements the employees of Metro, Tram and trolley buses have seen their wages reduced five times in the last 2,5 years. They claim that the main problem at this particular moment is the abolition of the collective labour agreement practice. The Greek citizens have been waiting for three days – yes, three whole days – for the bi-party leaderships to agree on what? On forming a government and appointing a new Prime Minister!! This feat has not yet been achieved. While waiting, the Greek people have been living with the fear of new taxes and cuts being imposed. The European Union leadership, on the other hand, is concerned only with the payment of the debt. It is worth wondering whether European leaders realize that they were elected to serve their people and not their banks and corporations. Presently, the Greek public is still waiting for PASOK and New Democracy to form a government and nominate a Prime Minister. In the meantime both parties have agreed on the date of the elections. The argument of the left wing parties, which is echoed by the “enraged” movement, is that the present government is illegal. They ask for elections in order to have a government that will represent the present relation of power in the Parliament. At the moment, the Council of Ministers is meeting and we are expecting developments any moment. I have refrained from posting any news recently fearing that I would be proven wrong. Contradicting reports follow contradicting reports. You write an analysis and before posting events reverse all your suppositions. The only journalists who can do their job are the tv journalists. Therefore, let me just tell you that Parliament is in session and this evening there will be a vote of confidence for the Papandreou government. The amount of votes required depends on the parliamentarians present at the moment of the vote and that is a big question mark since the PASOK MPs refuse to say what they will do, the New Democracy refrain from being explicit while I have not seen any representatives of the left wing parties this morning. 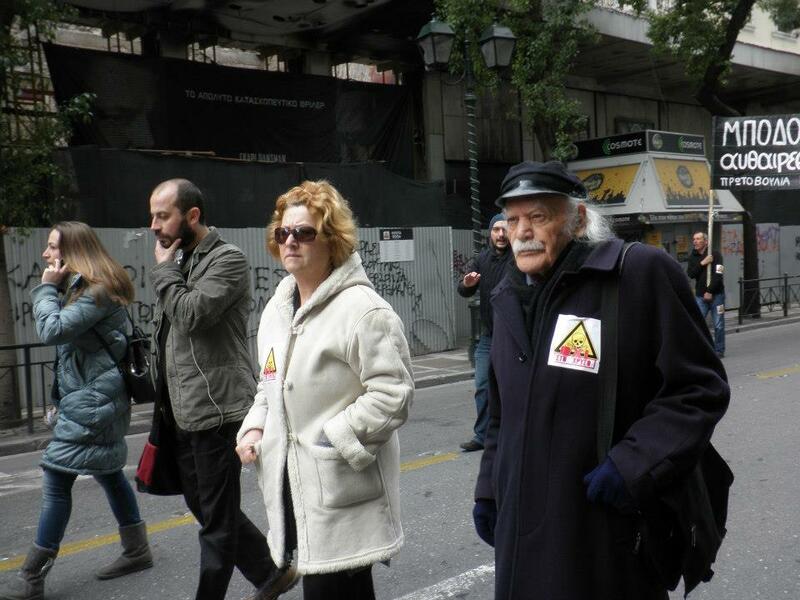 At the same time there is a call by the Unions to hold a rally in Syntagma Square during the voting procedure.